I've had this perfume for a year or so now and I have to admit it took me a while to actually start using it but now I find myself reaching for it most days. It's a lovely floral but, I think, quite fresh scent and its perfect for the day time as it isn't too heavy. Jo Malone says it includes peonies, red apple, jasmine (Whey! ), rose, gillyflower and blush suede. Once this has gone I think I'll be investing in the full size bottle as I do really like it and think I'd feel a bit lost without this to hand. 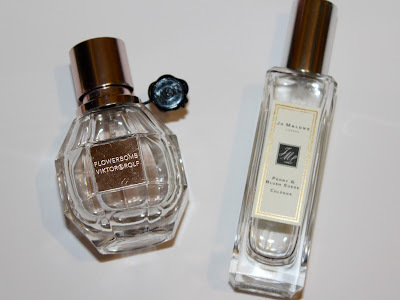 I rave about this perfume, over the years I must have gotten through litres of the stuff, its my all time fave. It's definitely more on the 'heavy' side and extremely floral (as the name would suggest- this one also features notes of Jasmine so I do think my nose is a bit biased!). I try really hard to only use it in the evenings and for special occasions but to be honest that never happens, something about this is just so comforting and 'me'. I also like it because, even though its pricey, it lasts on the skin for bloody ages making it good value for money, you really do only need a spritz or two and it'll be lingering hours later.